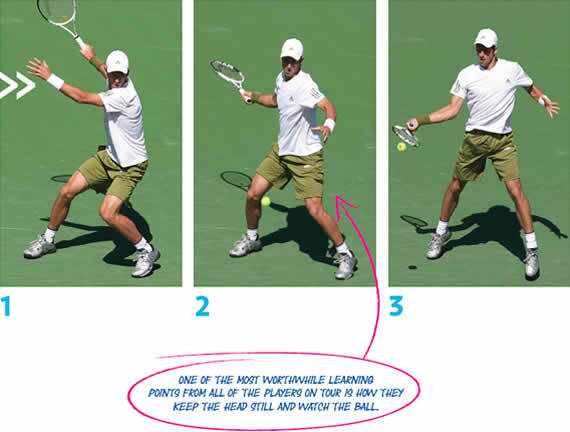 Known for his occasional on court impressions of other players, Novak Djokovic has a forehand worth imitating if you want to keep balance and control while generating power. 1. Preparation is superb; shoulders have rotated further than hips creating torque - like a wound up spring ready to release forward. His bent legs are wider than his shoulders, storing power to unleash upwards. 2. The left arm has started to rotate forward as Novak begins to release both legs upward and right arm forward. The head is still and the eyes are watching the ball. 4. Novak’s elbow is up and extended from his body indicating that he has gone through the ball. His forearm and wrist are fully rotated with eyes on the contact point .His balance and control are excellent. 5. Novak’s head is in the same position as he fi nishes the stroke. The elbow position is perfect (not dropped) and his rotation is complete with the shoulders further round than his hips. to recover. The elbow is beginning to drop as his arm relaxes at the end of the shot. There are three key elements to any shot. Consistency followed by accuracy and then doing both these things while moving well, so the ball is played mostly at the top of the bounce. The final element in the sequence is power. Power is a combination of leg strength, weight behind the ball, rotation and arm speed. Maximum power with control happens when these elements are in the right order. Play in half to three quarters of the left court with a basket feeder or a controlled rally. One player (feeder) takes the left court and hits the ball to the middle of the court. The player drilling plays only forehands to the left court. Feeder plays a second ball to backhand corner and the driller hits an inside out forehand. It is so important to get your body behind the ball as much as possible. 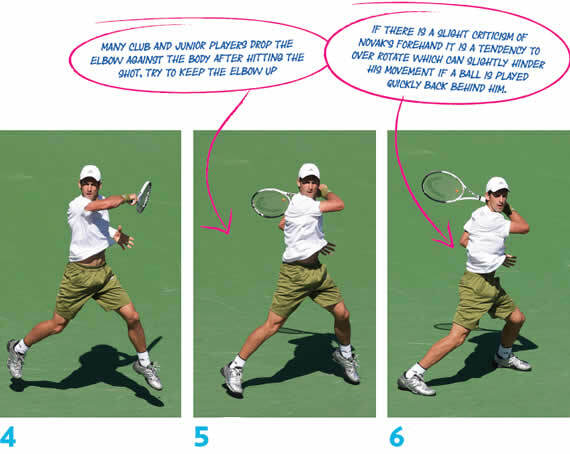 Players that are settled behind the ball are able to explode up through the ball imparting topspin (the up), weight of shot (body moving up and forward through the ball) and speed through fi rstly rotating the hips, then shoulders and finally racket head speed through a relaxed arm and wrist. Once in position watch the ball right onto the contact point.